We have been working on beginning and ending word sounds. 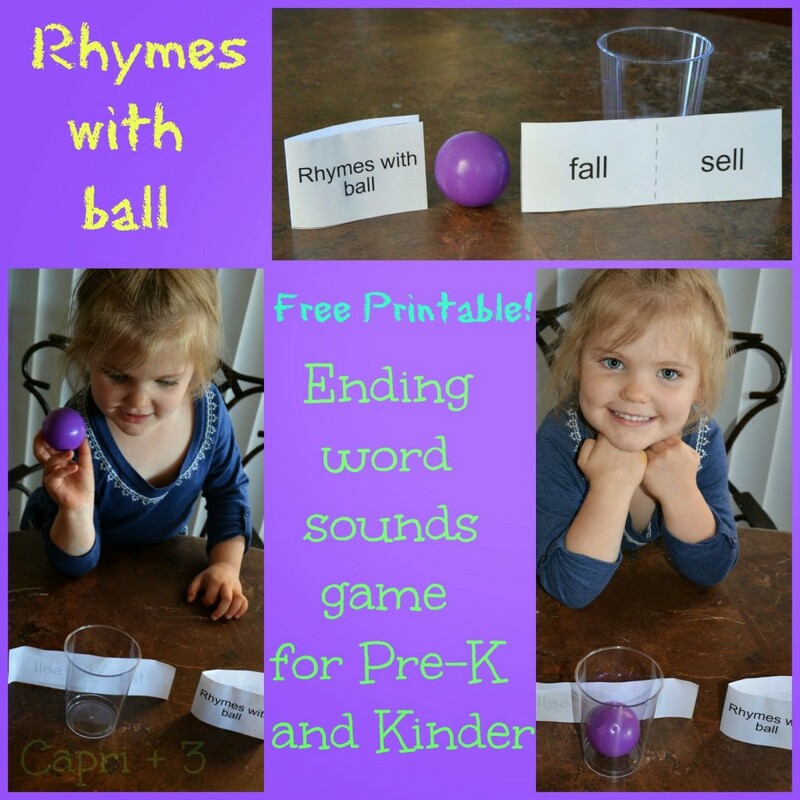 Since this week’s theme for Playful Preschool is balls, I decided to create an ending word sounds game. I have a free printable for you if you’d like to try this out at home or school. Print out the free printable cards. Cut them out in pairs as shown in the picture above. Fold the title in half so that it shows from both sides. Set one of the pairs in front of the cup and have your preschooler sound out the words and guess which one of the words in the pair rhymes with ball. When the answer is correct, he or she can try to throw the ball into the cup. An alternative is to have your preschoolers knock the cup over. Our preschoolers had a much easier time knocking it down than making it in (though they were thrilled when they made it into the cup!) If you try this out, let me know here in the comments or on the Capri + 3 Facebook Page. What a fun way to work on all ending words – we'll be giving this a go. I hope you enjoy it! It is interesting to watch them pick up on the subtleties of the difference between the -ell sound and the -all sound. This is a great idea! Such a fun way to work on a skill that may otherwise be boring for kids! It is so neat how many activities we can do with balls! Yes, they are very versatile! And most parents have a few on hand to use. Such a cool idea. I can't wait to do learning games with my little one. Such a fun idea! My daughter would really like this! My son would probably just keep knocking over the cup. It is fun when they get old enough to enjoy games… And fun before that too of course! Thank you for pinning. I hope your daughter enjoys this some day. Knocking over the cup can be really fun. Since we have four, we had some who enjoyed the challenge of trying to get the ball into the cup and others who found that frustrating but loved knocking it down!